abuse and neglect through the strengthening of families"
Cape Coast Castle (left), Wli Waterfalls (right). Valentino K.
My life changing trip to Accra, Ghana this summer was a collaborative venture between the Wilkie D. Ferguson Bar Association and the International Human Factor Leadership Academy. 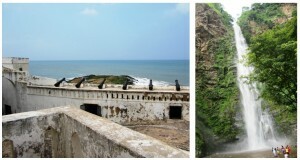 The program is designed to give local minorities from the Miami community an amazing and unique opportunity to travel to Ghana to help economically challenged youth and be exposed to cultural/historic sites such as suspension bridges, rain forests, slave castles, and much more! It’s absolutely amazing how your life changes after being somewhere other than your home country. Prior to Ghana, I never even considered studying abroad. I didn’t think it would have a major effect on my life or education, but just from going on a mission trip to Ghana, my opinion has changed drastically. I know now that studying abroad is accompanied by many rewards: You are exposed to a different culture, you get to travel, you experience personal growth and many more. I am grateful to have been able to expand my global knowledge and to have the opportunity to experience new things. The trip to Ghana has altered my life in many ways but mainly as an individual. Before the trip, I was one of those teenagers who always wanted sumptuous footwear and clothing. I had little tantrums, which were absolutely absurd, because I couldn’t obtain a new gaming console that my friends had. After voyaging to Ghana, I realized that those are just materialistic things. There are hundreds and thousands of individuals who reside in Ghana and other parts of the world that have virtually nothing and are thankful for every little thing they have. The Ghanaian people work industriously at everything they do. They try their hardest to get things that would be seen as nothing in America. The villagers near the ocean work together as a team to get their food, and the ones whom are reluctant to help, are not allowed to partake in the consumption of dinner. They used an inconceivably vast net to catch the fish. This was an arduous task for all of them but with the perseverance they all had, it was a success. When I visited the school, the children were grateful for diminutive things such as balloons, coloring pencils, a kick ball, coloring books, and several other things. I was flabbergasted by the sight. They immediately were filled with joy and thanked us numerous times. They hugged all of us and were just amazed with what we have done for them. Seeing this definitely made me think about the things in my life and touched my heart. In America, I feel like we take a lot of things for granted and expect to have everything we desire. I see so many people including the old me, who are not satisfied with the things they have. We want things like Xboxes, PlayStations, exotic vehicles, and expensive outfits, but in reality, we really don’t need it. It’s not going to kill us because we don’t have these things. We are just being acquisitive. We should all be appreciative of what we have, and not go berserk just because we can’t acquire things that are really unnecessary. All in all, this trip has helped me mainly to become a better individual, and to be appreciative of everything I have. Follow ValentinoÂ this summer as he embarks on a journey of self-discovery -where he takes his first trip out of Miami, volunteers overseas doing mission work and interns with a prominent Miami-Dade County Judge!